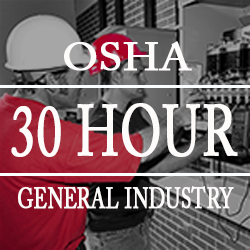 For general industry employees, the OSHA Online 30 Hour General Industry Training Course is required to meet Occupational Health and Safety Administration (OSHA) standards. While not the workplace-specific program such as HAZWOPER or Construction training, General Industry gives a baseline overview for workplace safety in a broader variety of job roles. This 30 Hour Course is accessible from anywhere, online, and includes a free PDF guide to use as a studying tool in between sections or as a go-to resource for specific OSHA regulations and standards. Once completed, your certification can be verified with the Department of Labor wallet card, signifying that you are trained and competent in general industry OSHA standards. Surfaces in the workplace – walkways, slip/trip prevention, etc. All pertinent sections are completed with a quiz to test your knowledge. At the end of the program there is a final exam, which must be passed with a score of 70% or higher. Upon scoring a passing grade and completing the program, you will be able to print out a temporary certificate of completion proving your mastery. The official plastic Department of Labor OSHA wallet card will be mailed to you approximately two weeks later, and is accepted in all 50 states to signify competency in OSHA General Industry Standards. Corporate Billing Accounts also available.